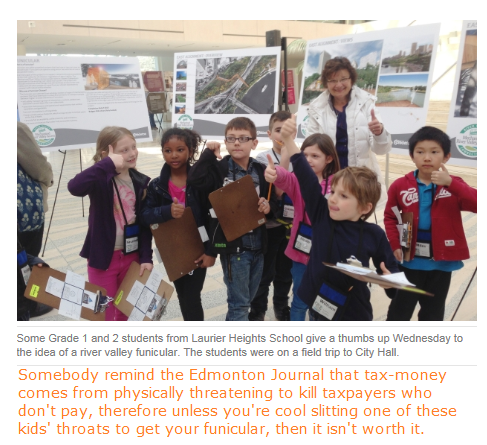 The Third Edge of the Sword: You can't spell "funicular" without "waste of stolen tax dollars"
You can't spell "funicular" without "waste of stolen tax dollars"
It's hard to narrow down the biggest thing wrong with this Paula Simons defense of the silly City of Edmonton funicular. There's just so much to chose from. An attractive lift that could ferry people — their strollers, bikes, walkers and wheelchairs — from the water’s edge to Jasper Avenue would make the park and the river valley pathways more accessible and make it easier for people to get from the south side into the downtown. It would be enticing for daily commuters and for visiting tourists. Funicular Defense #1 is that it will be like a Walmart is for a mall area: the anchor tenant bringing people in. Is it possible? Sure. Is it likely? Not in the slightest. The corollary to that defense is #1A, that people from the southside would love to get downtown, but having found themselves at the bottom of the river valley they are physically incapable without a funicular of getting to the top of the northside banks. Without such an option, they will simply have to climb up the equally steep south slopes and waddle themselves back to Terwilligar or Wild Rose or wherever they walked over from. Once there's a funicular, everybody will have a grand olde time riding the funicular up to downtown, spending the money that they were tightly pinching when they spent their time southside, and then riding the funicular back into the river valley...where they will again have to climb up the equally steep south slopes. Unless Simons wants a southside funicular to be built with hard-earned tax dollars too, of course. Don't laugh, that column is coming to your Edmonton Journal app by no later than February 2017. And funiculars themselves are just so quirky and cute. Such a signature installation might give the river valley the natty flair of a European mountain resort, turning the Mac into our own Grand Budapest Hotel. The Grand Budapest Hotel was a fictional scene in a movie. There wasn't only no funicular there, there was no hotel either. It's all a mockup, about the same size as Paula Simons' desk. Looking at movie props and thinking "why can't we build these in our town?" eventually ends with downtown Edmonton looking like Joel Schumacher's Gotham City. Finally Simons addresses the criticisms of the program: namely, it's a huge waste of taxpayer's money. But that $24-million price tag? It’s steeper than the river bank. The original budget to replace the 102nd Ave. bridge over Groat Road was just $32 million. Actually, the original budget to replace the bridge was $20.6 million and under Mayor Coward's incompetant 'leadership' the budget was raised to "just" $32 million, but let's not quibble over $12M wasted dollars here and there. Simons does also raise the important issue that the build price tag isn't the whole story: there's maintenance and operational costs that the City of Edmonton will need to endure lest the funicular decay to...well, how it looked during some of the later scenes of The Grand Budapest Hotel. How much is that projected to be? What's the total cost amortized over the expected lifespan of the funicular? Who knows! Having personally ridden on the Tünel in Istanbul (the second-oldest subway on the planet) I am somewhat aware of funiculars, how handy they are in the City of Seven Hills†, and am dimly away that Tünel was opened in 1875 and operated until 1971 -- 96 years running the original steam cars. Judging how Rexall Place -- newer than the 1971 electrified funicular -- is an embarassing old eyesore that needed to be replaced at great public expense, I'm confident that we'll need to spend money sometime between Opening Day 2017 and 2113. † Istanbul is indeed the City of Seven Hills (and only two funiculars). I've climbed every one of them. So with a projected build cost of $37M (applying the 102 Avenue bridge multiplier), that's the end of the argument, isn't it? No funicular for us. Well, it's been a fun post, hope you enjoyed it. Stay tuned tomorrow for another one, probably about the Alberta election. Oh, wait, Simons isn't done yet. Yet city council has little choice but to approve the funicular when it comes back before councillors next month. Yes, you read that right. Even though this is an unnecessary waste of money and will almost certainly tie up city funds for no particularly good reason, city council according to Simons "has no choice" but to say yes. Why? Well, it turns out it's "free money". The project is fully funded. Rob Marchak, director of strategic projects in the city’s urban planning and environment branch, says $8 million is coming from the federal government, $8 million from the regional River Valley Alliance, and $7.5 million from the province. The city is kicking in just $552,000. Of that, 25 per cent is coming from the park reserve fund. Only $414,000 comes from the city budget. But the money can only be used for this project. If the city doesn't spend it by January 2017, the funding disappears. It can’t be used for something more utilitarian like filling potholes. The city either spends it on the funicular and associated boardwalk or forfeits the cash. Hoo boy, now it's getting ridiculous. I want you to re-read this passage and see what first strikes you as being crazy as a justification to approve this project. Is it the part where she discounts money from the River Valley Alliance as just being a free gift from God? It's not. It's directly funded by shareholder municipalities which includes the City of Edmonton. The River Valley Alliance is dedicated to putting money into projects along the River Valley. It's true, they won't be funding any pothole repairs. They would, however, be funding other projects in the river valley. If the money doesn't go to this funicular it will either be spent on some other rivery valley project in the City of Edmonton or a better program in a different municipality. Presumably, if the River Valley Alliance decided it did everything it wanted to do and had money left over, the shareholders (including the City of Edmonton) would get the money back. So this isn't wasted money in any way shape or form, even limiting our scope to the City of Edmonton as an entity. Maybe you thought that it was equally absurd that 25% of the city's contribution coming from the "park reserve fund" was washed over. After all, that means the park reserve fund would have $138,000 less in a funicular world as a non-funicular world...and that assumes this same fund wouldn't have to be tapped into for funicular maintenance. "Only $414,000 comes from the city budget" rings hollow when the City of Edmonton seems to have so many "outside the budget" funds, all of which of course came courtesy of taxpayers. If you didn't think the above were farcical though, I'm afraid you're not going to find any outrage in this next bit, even though you should. The province and the federal government contributions to the project aren't "free" either: they come courtesy of the Canadian and Albertan taxpayer. Note, of course, that all Edmonton taxpayers are also Alberta taxpayers. Note, of course, that all Albertan taxpayers are also Canadian taxpayers. Which means that Edmontonians will be paying for this funicular anyways, just now we've agreed to bilk our neighbours for the tab as well! Don't get too excited, by the way, they're all agreeing to bilk us for their ridiculous urban projects as well, and this Prison's Dilemna situation is untenable. Left-wing governments bilk the taxpayer for these projects, then create a structure where left-wing columnists like Simons push the line that we "have" to take this money lest it be "lost". But it wouldn't be lost or wasted. It would be not spent on this. That means that it would be available to spend on some other expense the federal or provincial government has to face, like building a courthouse or an embassy. Or, barring a critical constitutional function of these governments, it would be a surplus that means next year taxes could be reduced and people would get to pay less. After all is said and done, Simons thinks we're "throwing away" money unless we...throw away money. She also stresses via the selection of quotes picked from city planner Rob Marchak that the funicular "only" costs $5M, and that we're supposed to buy that $19M is needed for all the other elements of the funicular, like a bridge and a boardwalk and a couple viewing platforms. You're supposed to ignore that the Edmonton funicular will only be 10% the size of Tünel (or 9% of the Kabatas-Taksim Funicular, also in Istanbul, which is a more recently built system and a closer comparison) which literally makes it about as useful as the moving sidewalk at the airport. She also throws in a couple quotes from the people at the city's open house (again, the City of Edmonton schedules its open house in a way that ensures that nobody who works for a living and could object to wasting tax money can attend), first the supporter and then the tentative opposition with his own pet project idea. I can't blame her for the heart-tugging picture I ripped apart above, but it speaks to the general nature of the piece. A horrible defense for a horrible idea. I just know she's right, City Hall won't be able to say yes fast enough.